This entry was posted in Australian Women's Writing, Book reviews, History, History writing. Bookmark the permalink. Wow, great book and thanks for the review, will look for it! 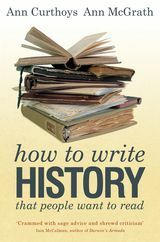 So many history books that are as dry as a drought-riddled plain are bursting with rich resources but it’s difficult to stay awake as you plod through them, while others that are easy to read have eliminated the footnotes, references, etc, leaving the text somewhat wanting. Some sort of cross over from PhD text/thesis and for general entertainment type writing medium is needed to grab those who’ve been burnt by boring history teachers at school. Don’t make it so hard. Start with a tease about the scandal, there always is one, and take your time getting to the detail. Not quite tongue in cheek. Like good television, what you think may be uninteresting and dry can be become riveting when well told. I admire writers with such skill. Then, some can fail with one book and succeed with another. Yes, they have both been at ANU and I assume still are. The Community Histories course sounds good- who is that with? Oh, this is a new course in Information Science at Charles Sturt Uni. It’s for library/archive professionals who acquire, manage/preserve, and provide access to local history/family history materials. I am really enjoying working on it. Can you tell me if this book offers anything to undergraduate students just writing small papers? Or should I wait until I’m due for a longer project before picking it up? I think that it’s more aimed at a longer project- maybe a major research project in later years of an undergraduate degree.